Big Bird is one of kids favorite Sesame Street characters. 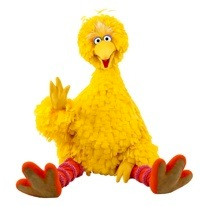 His big size, yellow feathers and sweet personality draw children to him. 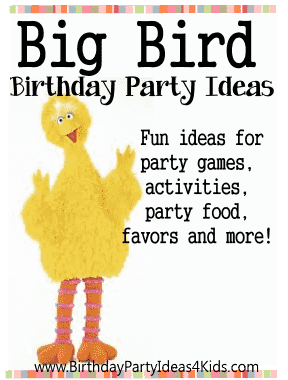 Big Bird party ideas will make planning your next birthday fun and easy! Big Bird themed party games, activities, invitation ideas, decoration ideas, party food suggestions and more! Great for girls and boys ages 1, 2, 3, 4, 5, 6, 7, 8 years old. A fun game to play when the kids are arriving and waiting on everyone to get there. The children try and count the number of objects in a jar. Then they write their guess down including their name. The winner is the one whose guess is closer then anyone else. Before the party you will need to buy yellow candies and some small toys. Count them while placing them inside the jar then put the lid on. Write the number of items down so you can refer back to it later. A see through plastic container or jar works best. Announce the winner of the jar towards the party's end when children are waiting on their parents to pick them up. You will need several yellow balloons that are blown up. Give each party guest 1 yellow balloon and ask them to try and keep the balloon off the ground by gently batting it into the air with only their hands. If they drop the balloon they can pick it up and try again. For older children you can change it up a little and ask them to only use their feet, elbows or heads to keep the balloon in the air. Or give party guests 2 or 3 balloons at one time to keep off the ground. A relay style race where kids try and blow a feather from one side of the party room and back. Before the party buy a package of yellow feathers. Divide the kids into 2 teams. Then have them stand one behind the other in line. Give teams a large fluffy yellow feather and ask them to blow the feather to one side and then back. When they get back to their line the next team player takes a turn and so on until everyone from the team has finished the relay. The idea of the Birdseed relay is for two teams to move Big Bird's birdseed from one container to the next container in the fastest time. Buy one or two large bags of birdseed and place them in a large container or tub at one end of the playing field. Then set out two smaller containers that are the same size at the other end of the playing field. On the two smaller empty containers draw a line at the same spot on both containers that will be the fill line. We've found that using clear plastic containers work the best so that everyone can see them filling up. Divide guests into 2 teams. Give teams a small paper Dixie cup or plastic spoon. One by one the teams must take a scoop of Big Birds' birdseed, race to the empty container, deposit the birdseed and then race back and hand the scoop to the next child in line. The team that fills their container first wins! Treasure Hunt (Treasure hunt instructions). Before guests arrive write down clues that will lead the kids from one clue to the next as they solve them. You can ask questions about Big Bird or any of the Sesame Street characters, ask them to count, recite the alphabet or do little challenges like build a block tower before they get their next clue. Hide a basket of treasure (candies and small toys) and ask the kids to go and find the hidden treasure. This game goes fast and the kids love it so make up lots of clues and tasks for them to find along the treasure hunt. You could also set out some yellow feathers along the treasure hunt to help them find the clues. Pin the Tail Feather on Big Bird – use yellow feathers and a large poster of Big Bird and see the party guests can pin the feather onto the poster closest to a spot selected before the game. Send out yellow solid color note cards. Embellish with a few yellow feathers glued to the top of each card. Make Big Bird's face on the front of a solid yellow cards by gluing two large white circles side by side in the middle of the card. Then glue small black circles inside the white circles. Glue a yellow rounded triangle underneath the white Bird Bird eyes. Attach a few feathers to the top. Along the path to the entrance make chalk drawings of Big Bird's footprints. Or make the footprints out of paper or yellow poster board then tape them down in one line so it looks like Big Bird has already arrived at the party. Lay down some yellow feathers along the path for guests to see as they are walking up towards the party. Hang yellow feather boas around the doorway to the entrance of the Big Bird party. Decorate party tables in bright yellow tablecloths and use solid orange and red plates, napkins, cups and flatware. For a fun effect fold yellow napkins into triangle shapes and place the flatware inside and if possible buy square plates … you then have a circle (cup), triangle (napkin) and square (plate) at each place setting. Cover tables with white butcher block paper and sprinkle lots of crayons across the table for children to draw with while they eat. Decorate the present table to look like a Big Bird's nest using shredded brown grocery sacks. Buy several unpainted wooden picture frames (find them at craft stores for about $1) and set them out on a table covered with newspaper or a plastic disposable tablecloth. Along with the frames set out bowls of yellow paint and paintbrushes or sponges. Have party guests paint and decorate their wooden picture frame with yellow paint. When they are dry hot glue yellow boa style feather to the top of the frame. See our picture frame crafts for more fun party craft ideas. Using cookie cutters with ABC or 1 2 3 shapes cut out fun shapes with any of these items and place on trays ... fruit slices, hamburger patties, Jell-O Jigglers, cookies, brownies, cheese, sandwiches. You can also make individual pizzas and use the cookie cutters to make shapes from slices of mozzarella cheese. Bright yellow party bags with yellow feathers hot glues around the top of the bag. Fill with party favors and then add orange and pink tissue paper. Bright yellow party bags with two large white circles and two small black circles in the middle of the white circles for Big Birds' eyes - glue on the yellow bags.